A comforting take on steak and mash. Rub the steaks with the thyme and 1 tbsp oil and set aside. Put both types of potato and the garlic cloves in a pan of water, bring to the boil and simmer until tender. Drain, mash, then stir in the crème fraîche and season. Meanwhile, soften the onions with 1 tbsp oil in a small pan on a low heat, for 12–15 minutes. Add the vinegar; set aside. When the mash and onions are ready, season the steaks and fry them on a high heat for 2–3 minutes on each side, then set aside. Put 75ml water and the onions into the pan; cook for a few seconds, scraping the pan with a wooden spoon, and season. Serve the steak and mash with the onions spooned over and the blanched leaves on the side. 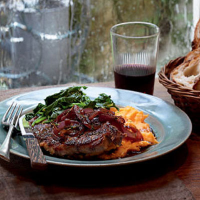 The full, fleshy and intensely fruity flavours of Zinfandel make it perfect with steak. Here, rich blackberry and subtle spice create a winning combination.